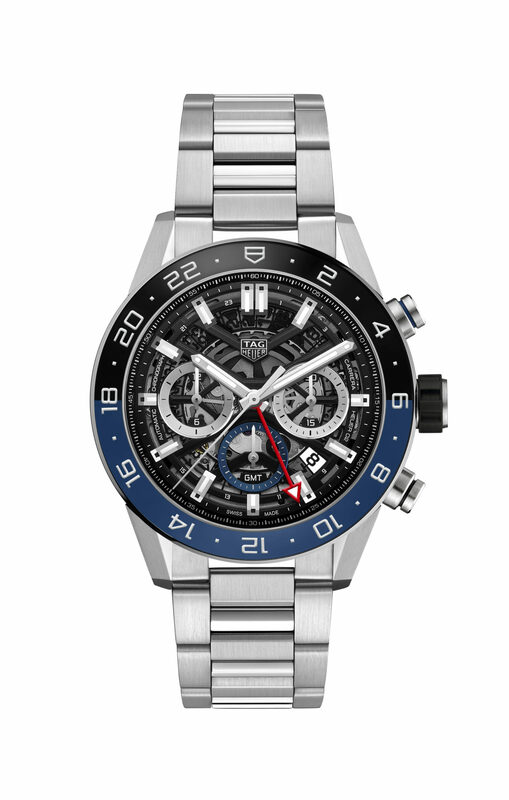 TAG Heuer is adding a GMT feature to its Carrera piece to celebrate 55 years of Heuer Carrera. The 45mm piece comes in steel with a matching steel bracelet. The casing houses the skeleton dial, along with the ceramic 24 hour scale black and blue bezel. The chronograph minutes and hours are at 3 and 9 o’clock, with the permanent small second at 6 o’clock and the date window at 4:30, completed by the GMT function. Centrally, sits the hours, minutes and seconds hands, the hours, minutes and seconds being rhodium plated, the red GMT hand being steel. The Heuer 02 manufacture movement, visible through the skeleton dial, is housed inside a solid 45 mm steel case, water-resistant to 100 metres and boasting a 75 hour power reserve. The TAG comes with a rubber strap as an option also.